Many employees from the East Lansing Police and Fire Departments came to see the promotions of some policeman and firefighters at the East Lansing City Council meeting on Oct. 16. Randy Talifarro celebrates the promotions of Pat Greathouse (left) and Lt. Mark Koonter (right). Chad Connelly was promoted to captain of the East Lansing Police Department. Connelly has degrees from Central Michigan University, Lake Superior State University, and Michigan State University. After college, he was hired by the East Lansing Police Department and has been there for 20 years. He was hired as a policeman back in 1998, promoted to sergeant in 2012, lieutenant in 2016, and captain on Aug. 31 of this year. Just a few of Connelly’s special assignments include K-9 handler, K-9 supervisor, special response team, detective sergeant and detective lieutenant. 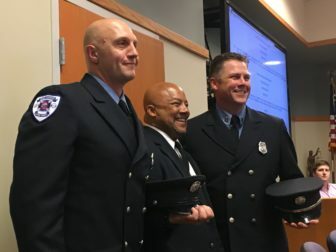 Fire Chief Randy Talifarro announced two promotions. Lt. Mark Koonter has nearly 20 years on the job. He’s been a lieutenant for the East Lansing Fire Department for two years and a medic for 23. Beyond that, he’s been very active in fire department committees and other activities. Most recently, Koonter ran in the Chicago Marathon and he did that to raise money for the Muscular Dystrophy Association. Firefighter paramedic Pat Greathouse is a 10-year East Lansing Fire Department employee. He attended Lansing Community College and Grand Valley State University and worked about 10 years as a machinist. Later, he decided to change careers, so he became a firefighter paramedic. Natalie Kerwin is a journalism major and spanish minor at Michigan State University. She is focusing on sports journalism with interests in sideline reporting or hosting. Her passion for storytelling has led her to jobs with the MSU Athletic Department and Big Ten Student U, as well as internships with HOMTV and the Big Ten Network in Chicago.